Anthony Planakis, the NYPD's go-to guy for bees, removes a hive from a tree at the corner of 188th Street and Melrose Avenue in the South Bronx. MELROSE — Spring has sprung, the flowers are out and so are the bees. Some 7,000 to 8,000 hunter bees were removed from a tree and the bodega next to it, at 154th Street and Melrose Ave. in the South Bronx, by an NYPD bee specialist Monday. The store and the tree were just two of many potential citywide target destinations for swarms this spring, according to Anthony Planakis, an active police officer and the NYPD's go-to bee guy. "With the early bloom, the early nectar flow and the early spring this year, you're going to be seeing a lot more cases like these," said Planakis, 50, who has been in the bee business for more than 30 years. He is on-call for many bee swarms citywide adding that the normal swarming season usually begins in May and lasts through July. 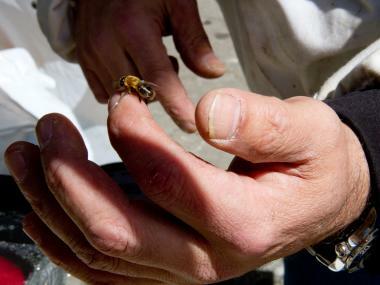 Anthony Planakis, the NYPD's go-to guy for bees, holds a worker bee that came from a hive he removed from a tree at the corner of 188th Street and Melrose Avenue in the South Bronx. As well as the main tree swarm, an estimated four more swarms were drawn to the flourescent light fixtures under the awning of the Family Grocery #1 convenience store at 689 Melrose Ave.
As soon as the queen and her primary swarm were captured in a specially designed box, the rest of the bees began to disperse. The queen will be relocated to a yet-to-be-determined home. Monday's swarm was nothing compared to some jobs Planakis tackled, he's said, where hives can contain as many as 20,000 of these buzzing insects. Swarming is a natural part of the seasonal activities of bees, Planakis added. Around this time of year, a queen bee is reproducing, and possibly causing some overcrowding in the hive. This creates the need for the colony to relocate, creating primary and secondary swarms, he said. Ruben Toledo, who has owned The Family Grocery #1 for more than 15 years, said that this is the first time he has seen anything like this at his store. "I didn't even know about it," he said. 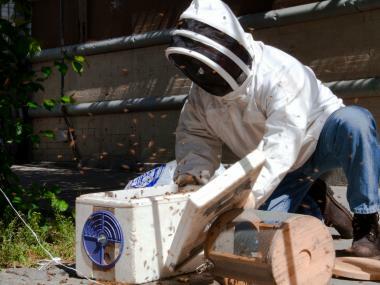 "I am just [hoping] that someone does not get stung with all of those bees out there." Planakis keeps many hives between his Queens home and a location in Connecticut. He said he was not sure what he will do with this hive.